For my ornament, I found a little pie tin at a little craft store I shopped at while I was in Utah. I picked it up for a couple of bucks with the intention of altering it. I used the brand new cling set called, Sparky the Snowman. I colored him with these Copic markers: C0, C1, C5, E31, E33, E37, Y38, R37, R08, G16, G03, BG78, B000, and the colorless blender. I Crystal Lacquered his nose and the birds. I cut the image out using a Spellbinder's circular die. I used texture paste and glitter to create the snow. If you are looking for more fabulous Christmas inspiration, be sure to check out the other designer's blogs!!! Have a wonderful day! Thanks so much for stopping by!!! 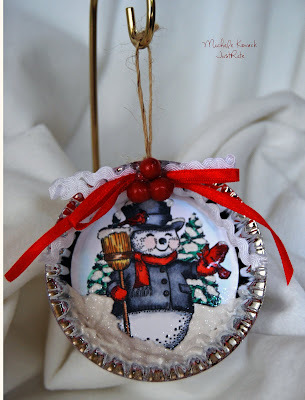 What a brilliant idea for an ornament...so beautiful too! oooh Michele this is sooo cute!!! Gorgeous ornament, Michele. LOVE it. This is cute as can be. That is adorable! Great use of something unchristmas- so very Christmas! What a lovely ornament. Thanks for sharing!! This is so beautiful Michelle. How fun! Love the snowman and all the snow! 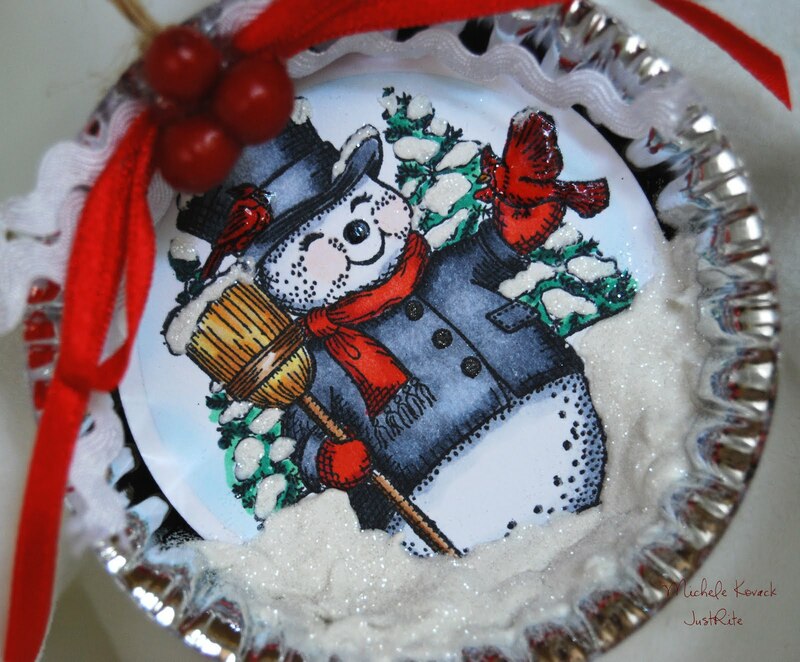 Very cute idea for a snowman ornament! I love the touch of red. Love this, Michele! So gorgeous!!! What a great idea, Michele, this is darling! What a wonderful ornament. Luv the little pie tin. This would be so cute hanging on a tree or added to a special gift! Its cute and fabulous ornaments. Good Friends Stand by Your Side! Crafty Secrets DT Sewing Challenge!